Sherry, this sounds terrific. I’ll order it and hopefully get to it before the next semester’s onslaught! Sherry, this seems to be a new, refreshing and reasonable outlook on Scripture, particularly the juxtaposition of Jesus and the Prophets whom He constantly quoted. I am reading from so many sources lately that we must find a new way of being ‘church’ – of translating the meaning and actions of Jesus’ message. Thank you for telling us about this. 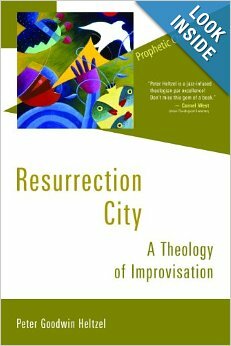 The jazz metaphor works very well as a literary technique here — very easy for modern Christians to identify. That’s an interesting thought…Lectio–that does seem much like improvising scripture, letting it flow, twist, turn, erupt and become still, all in the hopes and desires of arriving at a transcendence in Spirit. I don’t recall saying such a thing, but your remarks led me to think about it and it does seem to flow easily with the jazz metaphor. Thanks!